While US labour unions are not the force they once were, Democratic Party candidates live or die on union endorsements. Union approval means publicity, campaign volunteers and money. In the battle for the Democratic US presidential nomination, bioth Hillary Clinton and Barack Obama are each trying to lock in as many union endorsements as possible. In recent years the hard left has recaptured the US labour movement. The president of the AFL-CIO, John Sweeney is a member of the Marxist Democratic Socialists of America and has presided over the re-conquest of the US labour movement by the socialists and communists. The DSA and Communist Party use their considerable influence to steer union support behind their favoured candidates. Barack Obama has had a long relationship with DSA and the Illinois labour movement. It's not therefore surprising to see DSA linked unionists throwing their support Barack Obama's way. 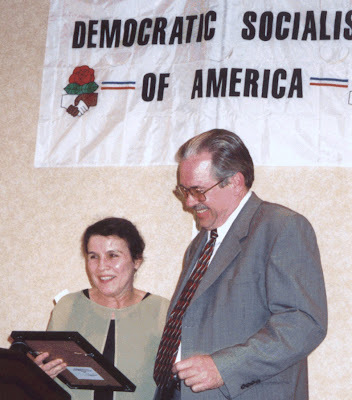 Every year Chicago DSA hosts the Debs - Thomas - Harrington Dinner, a major event on the Illinois socialist calendar. The dinner honours outstanding "community leaders" activists and unionists. Many if not most of the honorees are DSA members. All have done their bit for the socialist cause. 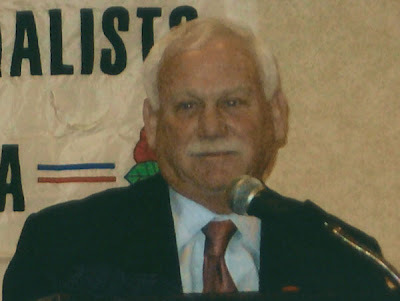 In the '70s Bayer was organizer for the Chicago Socialist party (a forerunner of DSA) and a member of the Young Peoples Socialist League National Executive Committee. Balanoff is a longtime friend and supporter of Barack Obama. Tom Balanoff, president of the SEIU Illinois State Council, said Obama's voting record is sound, with votes against trade deals like the Central America Free Trade Agreement and support for issues such as the Employee Free Choice Act. "We know that he's the real thing," Balanoff said. A former student leftist, Tamarin has been involved with Barack Obama in the socialist dominated Independent Voters of Illinois. Chicago DSA openly endorsed Barack Obama in his first election-the 1996 contest for a seat in the Illinois State Senate. It seems Chicago DSA may be backing Obama again-just a little more discreetly this time. We need to do all we can to get this message out. Obama has hitched his wagon to every radical group he can to capture financial support, and peer recognition. He is a user, and followers the course of least resistance to achieve his goals. Not a good situation for a man seeking to be Commander in Chief, as when following this direction is a dangerous course. Organizations, such as DSA, can let you go just as fast as they embrace you. When to fulfilling their passions they will go to a source that does, and hurt you on the way. Comment from American about to depart for Canada. Obama is whatever Obama decides is most expedient for Obama. Right now Obama is a Republican. He kept the same Secretary of Defense appointed by President Bush. He's all running around with the whole military salure. When he gets done with that, who knows what he'll be. Tell you one thing he is, he's a grandma's darling little boy! Comment from American about to depart for Canada, permanetly. Obama is whatever Obama decides is best for Obama. Right now he's a wing nut Republican, he kept the same Secretary of Defense appointed by Bush, and he's flying around in his military helicopter saluting the troops and invading the Middle East. When he gets bored with that, who knows. Tell you one thing definitely, he's grandma's little wonderkind, make no mistake. many of the real reasons causing poverty are ignored. Socialism nor capitalism fix the problem. Only leaves one to wonder where the US can go now.